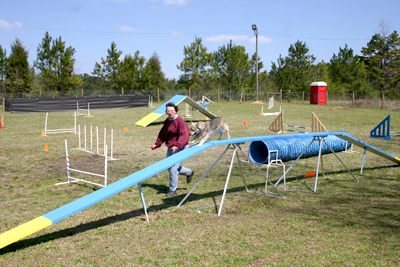 Lucky Dog agility is located outside of Winterville, GA. From downtown Winterville, travel on Main Street toward Arnoldsville. Leave Winterville city limits and enter Oglethorpe County. Continue ~1 mi. Turn right into a gravel driveway at 1103 on a black mail box.